Use your annual Winter Fuel Allowance to help a local family in fuel poverty. We will hold it in a fund, vet & pay fuel charges for local families that are in debt to their energy supplier suppliers. More details here. Click here for how to make your donation. We met some lovely people when we were out and about helping Santa this year. 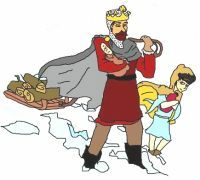 Apologies to those of you who thought Santa and his Lion Snowmen would be visiting you on Saturday 22 and Sunday 23 Dec when his sleigh was bust!. Thanks to Elf Phill Gower for fixing it. And thanks for your understanding and generosity. We entertained over 200 older folks at our event this year. We had some amazing entertainment from BEGINNERS ON STAGE - a fabulous group of young people from our local drama school, SHUFFLE TUNES - who were much, much more than a choir & the ELVETHAM COMMUNITY CHOIR were brilliant too. And many thanks to MORRISONS for letting us use their overflow car park. And a fabulous night was had by all!. The brilliant Bettesteiner Footstompers Oompah Band were back with us again and certainly made things go with ein voller Erfolg sein. Over 7000 of you joined us to enjoy over £6000 of fireworks, lots of good food and drinks, and had your fireworks party with us. 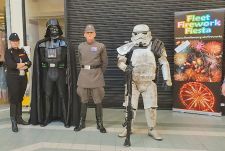 The Star Wars guys had a great time too! Do you enjoy being part of this great community? Want to know more how to help keep it great ? Join Fleet Lions and HVA and so many local groups from community service, scouts, environment etc. who rely on volunteers to make the town a great place to live. Come and talk to the Lions. 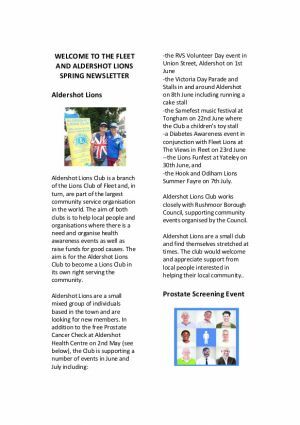 We'd like to find more members but also people who just want to help at the events we organise for the people of Fleet. What a fabulous day! 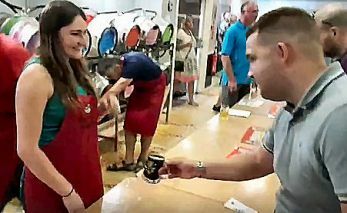 Over 900 of you came and drank over 3500 pints of 44 beers + ciders. 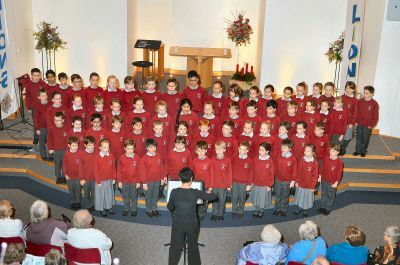 That has raised over £10,000 for charitable purposes. Silent Pool gin seemed to slip down well too. + great music and food. So Sebastian's Action Trust & Hampshire Search & Rescue went home with a nice cheque. No.13 WILL BE ON 3 AUGUST 2019, SO PUT IT IN YOUR DIARIES. We organised another screening event on 17 July at Fleet Hospital. It was for men over 45 who have not had a PSA test before. We screened 247 men. Thanks to those who helped and those who came along. What a fabulous day we all had - and over 250 amazing machines to be admired. Thanks for coming and allowing us to raise funds for the Phyllis Tuckwell Hospice and Fleet & Church Crookham First Responders. See some photos from the day taken by Lion Paulo Silva. 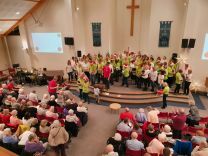 Our President James Powell joined in the 100th Birthday celebrations with hundreds of volunteers who came together with the organisations’ partners for this special occasion. Lions Clubs International focusses through its Lions and Leos members upon major projects that address diabetes, youth, the environment, hunger relief, childhood cancer and sight issues affecting communities throughout the world. And of course Fleet Lions do our best to serve our local community too. Fleet Lions go public! 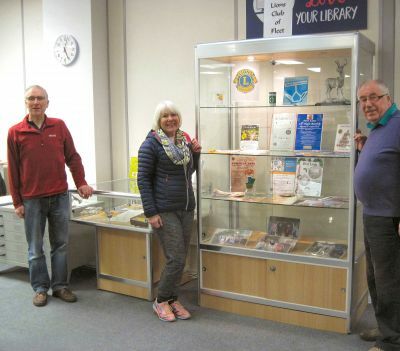 A big thank you to Fleet and Crookham Local History Group for letting us use their display cabinets on the top floor of the Library. Particularly to Colin for making it all look very professional. A chance to find out a bit about the history of Fleet Lions, why we serve, what we do, artefacts, awards and how to get involved. Do take a look! At a recent luncheon, the Lions Club of Fleet surprised ‘Elvis’ by honouring him for his years of charity work in the local area. It was a total surprise for Dave Hurrell aka Dale Fontaine when the Lions presented him with a Melvin Jones Fellowship – the highest award within the Lions Clubs International movement. For decades, Dave has performed his Elvis Presley appreciation act at dozens of venues for the benefit of numerous local causes including our own FunFest. He’s raised thousands of pounds for charities in North Hampshire and Surrey. Santa has put his feet up for another year! 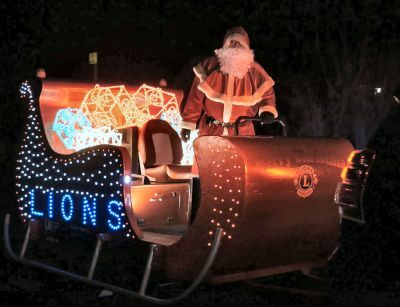 In December our Christmas Float toured the streets of Fleet and Church Crookham and gave pleasure to hundreds of young and old alike. 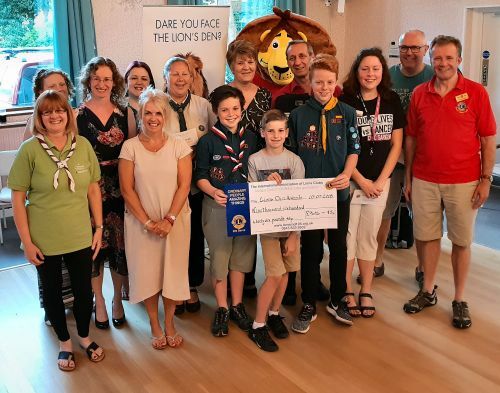 And the amazing news is that our generous residents donated the best part of £7000 that we and our friends from Hart Lions can use to help others. 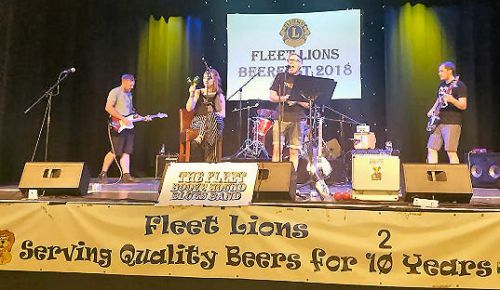 Our thanks also go to a number of cheerful 'Friends of Fleet Lions' without whom we would not have been able to operate. A particularly big thank you too to our Vice President Kevin who stabled, fed and watered our reindeer every night! 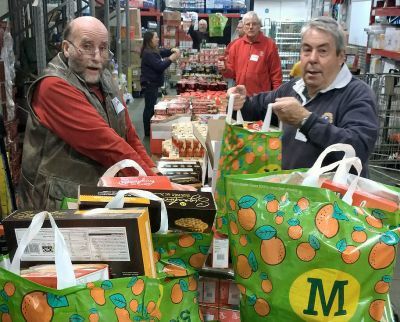 This year we had a lively morning in the storeroom at Morrisons where we packed 120 food parcels. They have all been delivered now and hopefully will help some local people have a bit better Christmas. A big thanks to all the staff at Morrisons for managing to avoid being tripped up by us! Sailability's new boat at Frensham Pond has been named in honour of a dear departed Fleet Lion, Past District Governor Lion Ian Imray MBE. Members of the Imray family, led by Ian's widow Joy, gathered at Frensham Pond, Surrey to launch the new sailing dingy named Lion Ian Imray MBE. The Hansa 303 was bought with funds raised by Fleet Lions and will be used by disabled people who wish to sail. Sailability's Chair, Kate Richardson opened the ceremony and thanked Fleet Lions for their generous donation and went on to explain Sailability's aims. "Through the Royal Yachting Association's Sailability, over 40,000 young people and adults with disabilities are introduced to sailing each year and many go on to sail on a regular basis. Sailing is one of the few sports in which able-bodied and disabled sailors can participate on equal terms." Fleet's 2013-14 President Lion Julian Behmber was instrumental in bringing this project to fruition and joined this year's Fleet President Lion Paul Doughty in paying tribute to PDG Lion Ian Imray MBE. Paul explained that PDG Ian had been a keen sailor in Zimbabwe where he and Joy and their family had lived until 2006. Joy blessed the boat with a bottle of bubbly and it was then launched to much applause. Joy was especially delighted that her 7 year old Great Grandson Evan was the first to sail her thanks to Bridget one of Sailability's instructors. Many thanks to Sailability's Tony Machen for making this video. For more information see the RYA Sailability website.